Juzou the Drunkard is one of the most imposing looking mini-bosses in Sekiro: Shadows Die Twice. His mammoth frame and huge sword makes the prospect of killing him, at first glance, seem like a truly daunting endeavor. With a sound strategy and a bit of forethought, the Drunkard can go down fairly easily. You can find Juzou in the smoldering Hirata Estate’s main hall. The Hirata Estate area is actually a flashback scene that you must unlock. 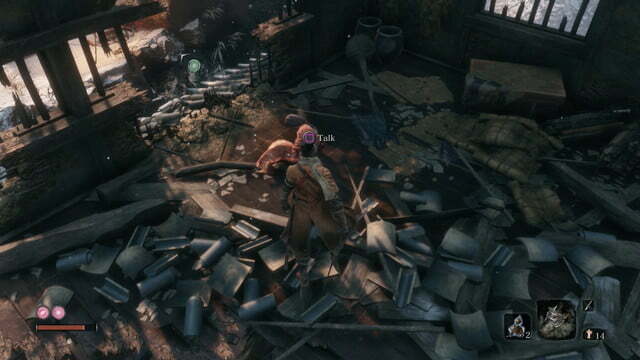 In the Ashina Outskirts prior to the Chained Ogre fight, you’ll meet Inosuke Nogami’s Mother in a small house. If you miss her, her son is on the ground just below, so if you see him then you’re closeby. She gives you the Young Lord’s Bell Charm, which can then be offered to Buddha statue in the Dilapidated Temple. The offering transports you to the Hirata Estate. Once you reach the Hirate Estate Main Hall Sculptor’s Idol, you’re about to meet the Drunkard. 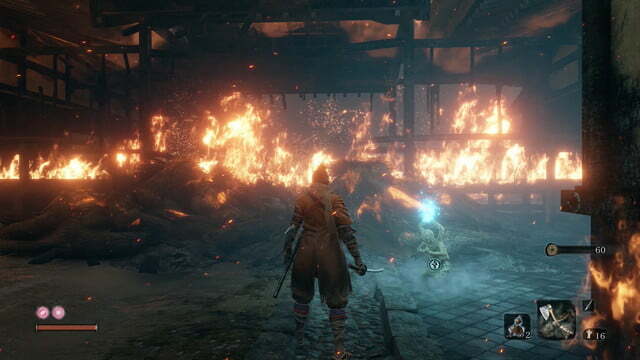 The path that runs through the burning buildings is filled with soldiers. It’s up to you whether you want to dispose of them or not. Just know that it is possible to avoid them altogether by grappling onto the rooftops on the right, running across, and then hopping down when you see the pond on your left. The Drunkard is hanging out on the other side of the pond. 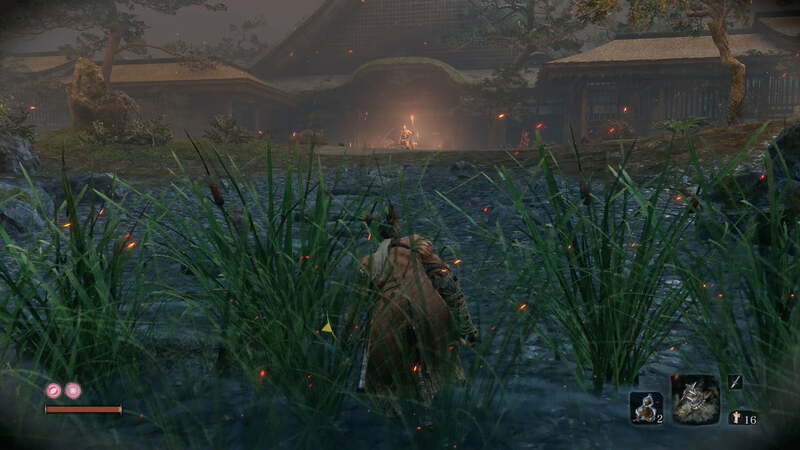 At the edge of the pond, you’ll find an NPC, but don’t speak with him yet. This is important. The Drunkard is surrounded by more than a handful of enemies, and two more lurk in the house to the left. You want to focus all of your attention on clearing the area of regular soldiers. 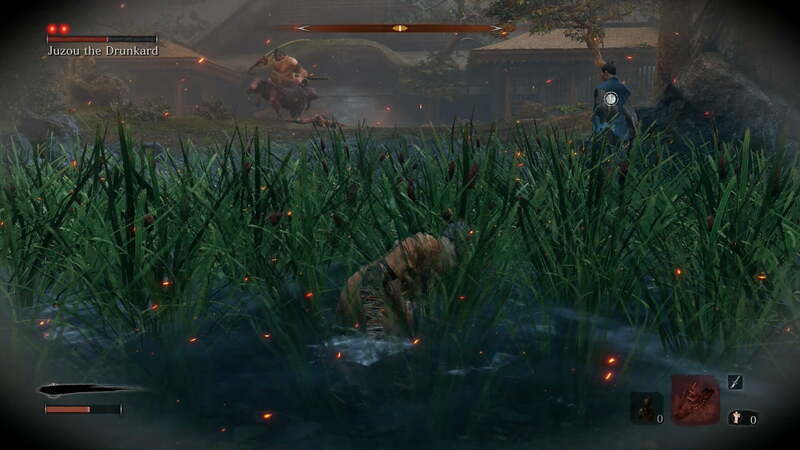 The Drunkard still comes after you, but the area is large enough as to where you can avoid him while luring small enemies to you. Clear out the regular enemies first. Evade until you can pick enemies off one by one. One of the enemies has a large wooden shield. It’s pretty hard to damage them as your sword cannot pierce the shield. 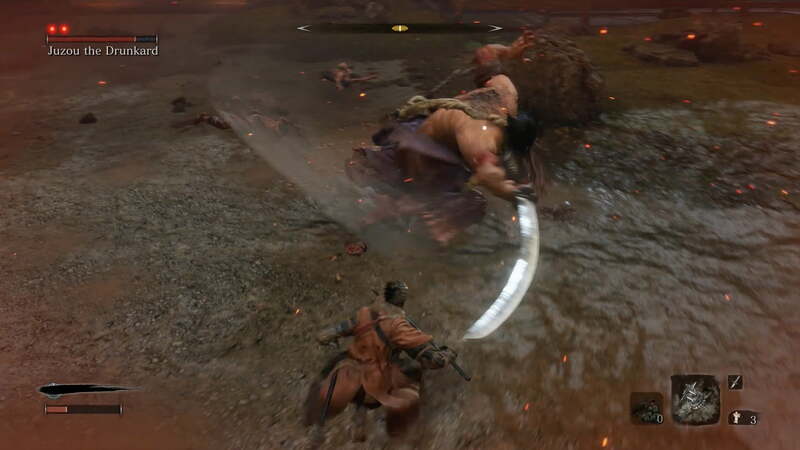 Without items, you’re left with trying to dodge around the shield. You don’t really have time for this, though. Instead, you’ll want to use either the Firecracker or Loaded Axe Prosthetic Tool. 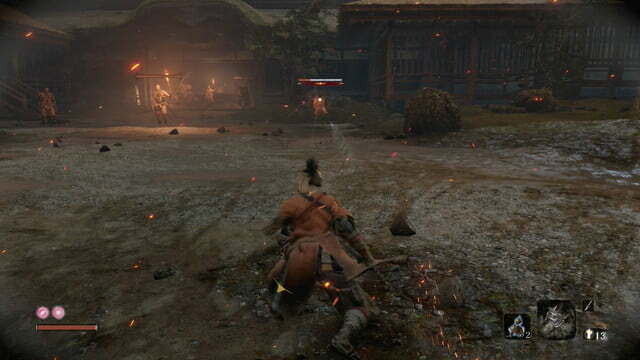 The Firecracker stuns the enemy to leave them open for critical Posture damage, and the Loaded Axe breaks through the shield. After the main area is clear, run through the house on the left. 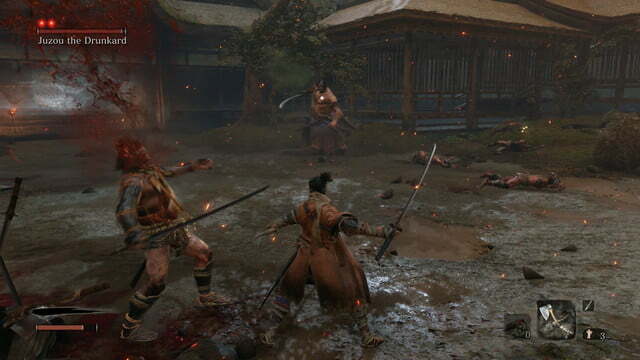 You’ll likely find two additional enemies standing guard. Take them out while being aware of the Drunkard’s location. 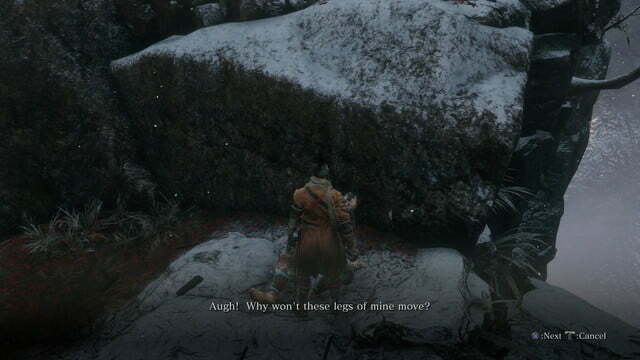 All Sekiro enemies other than main bosses forget about you after a while if you flee. Since Juzou obviously loves drinking and is probably quite wasted, his forgetfulness actually makes sense. To make him stop chasing you, you can either hide behind the house on the left or run back across the pond and crouch behind the rocks. Even if he begins to follow you, he’ll eventually stop, turn around, and head back to his original position. You only want to do this when all of the regular enemies are dead since you won’t be able to deal a deathblow otherwise. Now’s your chance to take away one of his two vitality bars immediately. Sneak through the house and approach him while crouching from behind. 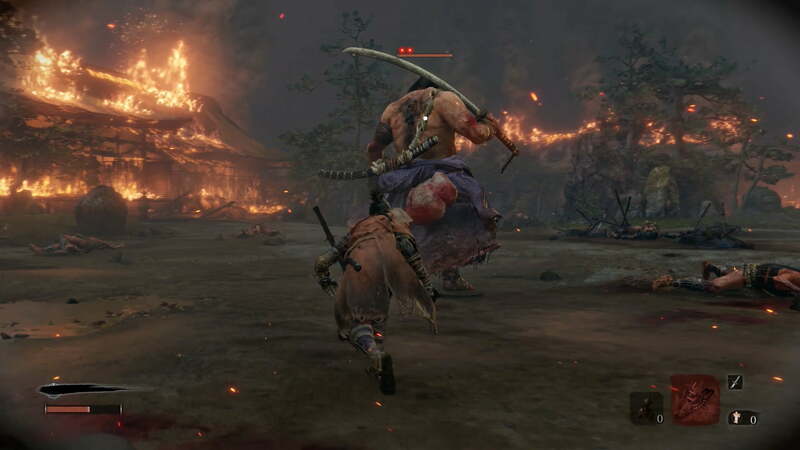 Once the red circle flashes on his back, press R1/RB to deliver a deathblow. Now you only have one vitality bar to deplete. With the Drunkard now on your tail with just one vitality bar, now it’s time to speak with the NPC. He’ll join you in the battle against the Drunkard, dealing damage and serving as a helpful distraction. If you speak with him when you enter the area, chances are he’ll be dead by now from dealing with minions and the Drunkard before you were ready to actually take the big guy on. That’s why waiting to recruit his assistance is so important. For a big guy, Juzou has a skip in his step, so don’t underestimate him. Besides regular sword swings which can be deflected to deal posture damage, the Drunkard has three high-risk moves. The Drunkard occasionally takes big gulps of drink and then vomits a cloud of poison. If caught in the area, you can lose vitality quickly. 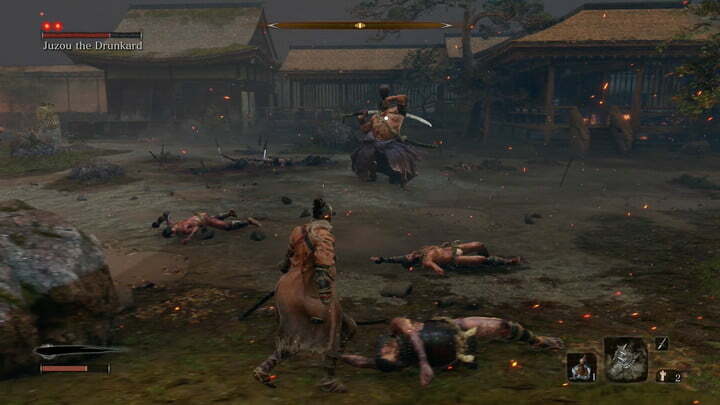 The move is well telegraphed though, so you can side dodge backward a couple of times to avoid it. Then immediately run up to him and slash as he wipes his mouth. If you get caught in the poison, use an antidote powder as soon as possible. Like all other mini-bosses, the Drunkard has multiple perilous attacks which cannot be deflected. The red danger symbol appears right before he initiates one. Luckily, the grab is easy to avoid. He’ll reach his left arm back before lurching. A simple backward side dodge will let you avoid it. Again, you have an opening to deal damage right when he misses. The Drunkard’s other perilous move is a low sweeping swing of his sword. He’ll lean over and pull the sword across his body before doing it. Once the perilous symbol comes on screen, get ready to jump. 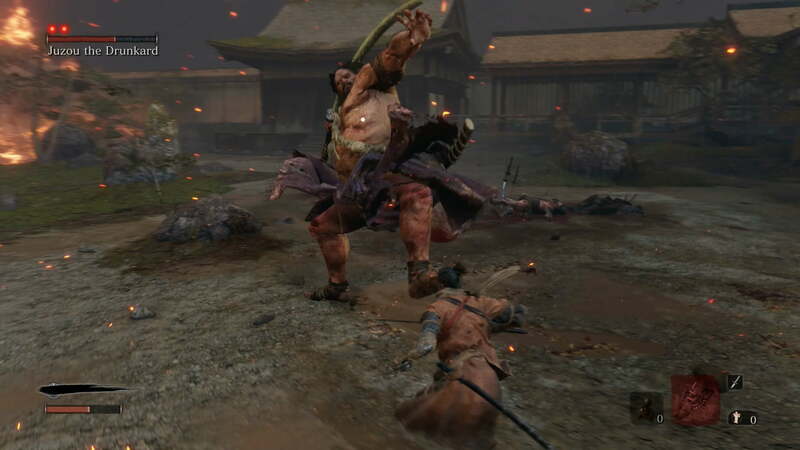 You can completely avoid the attack and kick him while mid-air if you’re close enough. If you’re having difficulty with the timing, you can also sidestep dodge this move by going backward or to the left. You won’t be able to get a hit in as quickly, but at least you’ll be safe. 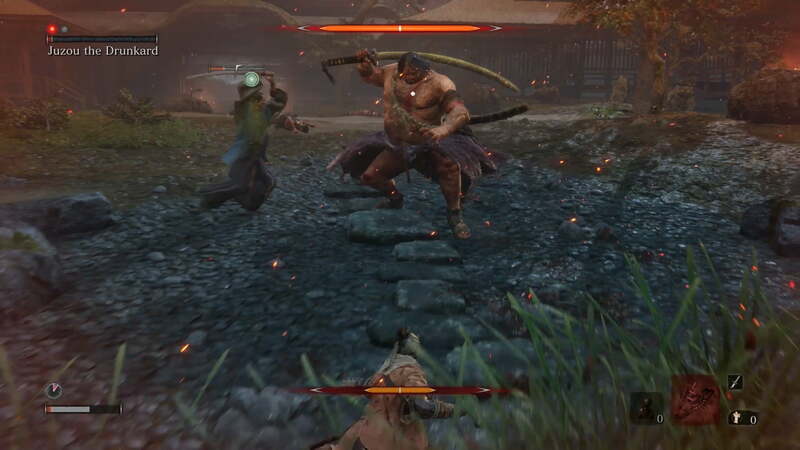 In terms of mini-bosses, the Drunkard can be quite punishing simply because you’ll likely be facing him early with little vitality upgrades and minimal Gourd Seeds for healing. 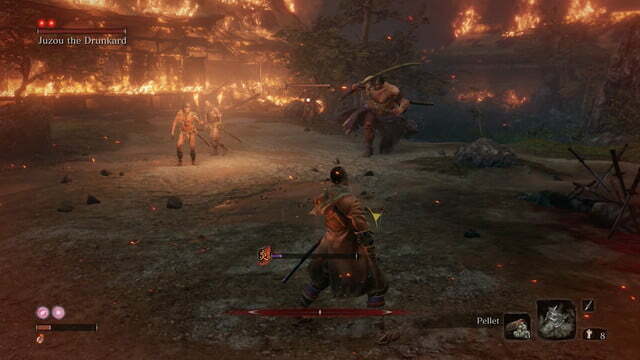 His attacks can decimate your health, taking away more than half with one hit. His Posture meter, shown in the upper center of the screen, is relatively small, though. Taking careful hacks can go a long way towards chipping away at his vitality and Posture. Generally, you should remain as close to him as possible, except after he takes a swig from his drink. Maintain a safe distance until he spews the poison, then return to slashing and deflecting. 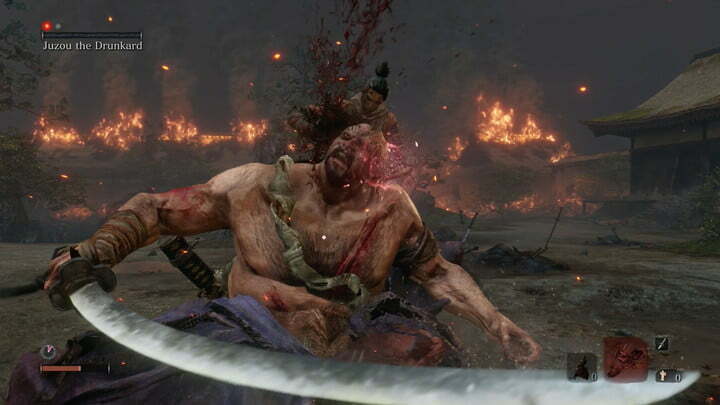 As long as you avoid his perilous attacks and the poison, you should be able to take him down without too much trouble.